These are Paleolithic Hand Axes and each one is quite unique. They are £75 each and come with a signed photograph of John Lord and his beloved late wife, Val. Try your hand at the ancient art of Flint Knapping. Held at Grimes Graves Ancient Flint Mines. Learn the skill used by our ancestors to create a range of tools such as hand axes, knives, arrowheads and axe heads. For those with an interest in the prehistoric era, this course offers you a great opportunity to understand the features and characteristics of stone implements. During the day you will be introduced to the tools that are used for Flint Knapping and shown how and when to use them, You will have clear and well-presented demonstrations of how to make a range of tools covering 3 Periods of the Stone Age, Paleolithic, Mesolithic and Neolithic. This means you will be shown how to make a hand axe, blade core for tools such as saws and burins, plus pressure flaking for producing fine arrowheads. When your day ends you will be pleased to know you keep the items you have made. This course is self-catered but refreshments are included throughout the day. You can also book a personal one-to-one tuition with Will Lord where you will be able to have Will's undivided attention. This is often popular for those who wish to progress further with this complex craft. Held at Grimes Graves, 4000, year old Neolithic flint mines. 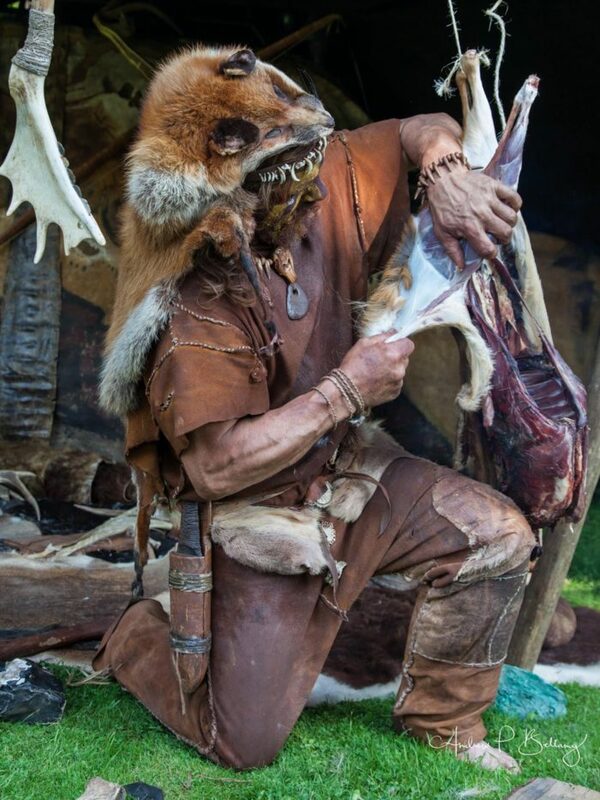 This primitive skills 1-day course is an excellent opportunity to teaching you what is available from an animal’s carcass other than just the meat and has been described as “A real stone age awakening”. The hunter gatherers of the past would have recognised that a hunted animal could provide a vast range of possibilities beyond the feast that it provided. During the course, you will learn how to butcher a deer, cook the meat over an open fire and enjoy these delicacies for lunch. Then with the aid of flint tools such as scrapers and burins, you will create artifacts that were used during the stone age. Some typical items are shown in the picture below. There is also the option of tanning a small section of hide if you choose. The course brings this period to life in a most valuable and resourceful way, as you begin to not only understand the time taken to produce small and effective life essentials, but it helps us to value how the whole animal can be consumed and honoured for the life that has been taken. This course is available for £80 per person for a 1day experience where you have a truly memorable experience and make some new friends during your time with us.